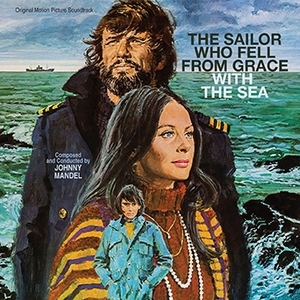 Johnny Mandel's score for The Sailor Who Fell from Grace with the Sea, is the 418th Soundtrack of the Week. Never saw this movie though I remember being very impressed with the book when I was a teenager and going through a Mishima phase. The main voice for Mandel's score is electric piano. In fact the first three tracks on the CD are solo electric piano. Strings and trumpet join the electric piano in "Jim's Shark", creating a sensuously eerie and suspenseful atmosphere. That describes most of this record, actually. Mostly plaintive electric piano statements, often accompanied by strings and trumpet. There's also an instrumental arrangement of Kris Kristofferson's song "Sea Dream", which I guess is in the movie though the original vocal take isn't on this CD.